The corned beef, turkey plate go-to will boast deals galore, as will Magee's House of Nuts. You've enjoyed a corned beef plate, or a turkey dinner, at this longtime LA favorite? Celebrate its centennial with a delicious deal on Friday, Oct. 27. They seem to be pretty common in a metropolis that holds millions of busy people, and a caboodle of attractions, and an endless array of businesses, and numerous natural destinations. In short? The sheer number of beings and things in Southern California means that strange and unlikely intersections are quite possible, and even probable. But what are the chances that DTLA's own Grand Central Market, "the granddaddy of food halls," and Magee's Kitchen, the first tenant of the Original Farmers Market at Third & Fairfax, would share the very same 100th anniversary date? They do, which is the odd "huh" fact — the date is Friday, Oct. 27, 2017 — but the oddness slips away when you discover that Magee's Kitchen debuted inside Grand Central Market, downtown, on Oct. 27, 1917. 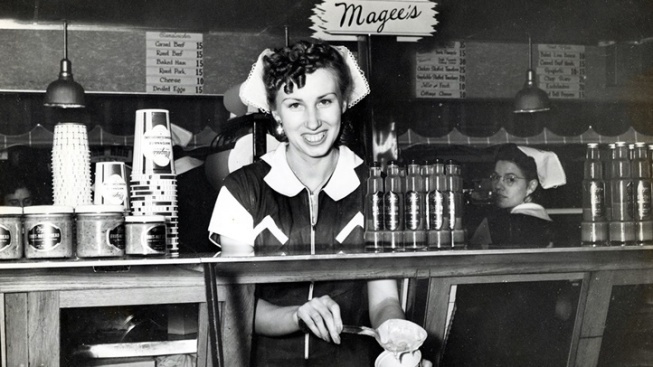 The clocktower'd landmark at Third & Fairfax opened in July 1934, and Magee's Kitchen, the "first and oldest merchant" at the Original Farmers Market, made the jump west to the new public market (which is now over 83 years old). Which is all to say this: Yes, the "coincidence" is cool, and not really a coincidence at all, and yes, there's a mega party at Grand Central Market on Oct. 27, complete with a 100-layer cake. But Magee's and Farmers Market will be rocking their own revels, too, with a day of speeches, live tunes, food deals, and family cameraderie (it's an eatery that's been traditionally run by a tight group of kin, as well as a treasured group of longtime employees). As for the specials on Oct. 27? Look for the special Magee's $1 anniversary menu, from 11 a.m. to closing, with "12 of the Original menu items to choose from (limit 5 items per person; dine-in only)." Yep, that famous-all-over corned beef sandwich, the one that draws the green-wearing crowds on St. Patrick's Day every year, is on the line-up, as are cheese enchiladas and other classics. There's a canned food drive on, too, in support of the Greater West Hollywood Food Coalition. Show with a can of food to donate and receive a dollar off your regularly priced Magee's order. And if you're hoping that Magee's House of Nuts, which is a few market aisles away from Magee's Kitchen, will be in the flow of the festivities, well, count on it: The stall's famous made-right-there peanut butter will be priced at a buck. You've seen the old-school machine that stirs this luscious spread? The one that's hard to stop watching once the peanut butter churning commences? It's one of our city's greatest culinary artifacts, fact. The nut-packed snackery was founded by the Magee family, as the name reveals. It's also an original tenant of the Original Farmers Market, so yeah, believe it: It's partying, too, on Oct. 27. Happy 100th to the horseradish-iest hot spot in town, a savory, stick-to-the-ribs favorite that has downtown roots, and modern mid-city mojo, and still serves some of the most famous corned beef in all of California, and beyond.